Spread the word: The triangle is not the revised Bloom’s Taxonomy. Why does this matter? All good teachers savor “aha” moments—when students demonstrate deep understanding, make connections, or transfer their learning to new situations. Most educators aim for a level of comprehension that moves beyond simple memorization. We want our students not only to retain what we’ve taught them, but also to be able to relate it to other things they encounter, using each new situation to add nuance and sophistication to their thinking. Along with dozens of teachers I know, I have spent countless hours trying to find strategies that build a depth of understanding. But a mountain of research tells us that the average classroom has remained remarkably unchanged over the past 100 years. The content addressed and the level of thinking required continue to largely remain at the surface level (Hattie, 2012; Mehta and Fine, 2015). Bloom’s Taxonomy is one of the most recognized and used educational tools that attempts to move students beyond simple memorization. Nearly every trained educator has some knowledge of Bloom’s Taxonomy and the hierarchy of different types of thinking—from recall to analysis or synthesis. The first taxonomy was published in the 1950s. Many educators also know that there is a revised Bloom’s Taxonomy, created by a team led by Lorin Anderson, who worked closely with Bloom on the original version. 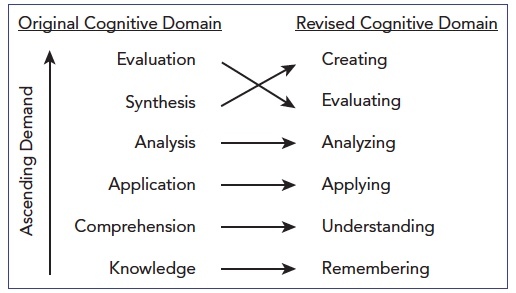 The revised version made minor changes to the thinking hierarchy, such as replacing “knowledge” with “remembering” and replacing “synthesis” with “creating,” which it now places at the highest point. See below for an illustration of the revision. Adapted from: Anderson, L. W., & Krathwohl, D. R. (2001). A Taxonomy for Learning, Teaching, and Assessing: A Revision of Bloom’s Taxonomy of Educational Objectives. New York, N.Y.: Pearson. Most educators are familiar with this shift, which reminds teachers that creating new knowledge is the most demanding cognitive process, while simple recall is the least demanding. Even though the original triangle shape of Bloom’s Taxonomy is nowhere to be found in the revised publication, the vexing shape persists today. See the figures below from a recent blog post on Education Week (I hesitated to reprint them). Source: Berger, R. (2018, March 15). “Here’s What’s Wrong With Bloom’s Taxonomy: A Deeper Learning Perspective.” Education Week. THE TRIANGLE IS NOT THE REVISED BLOOM’S TAXONOMY. Few educators, including those who criticize the taxonomy, have considered the other major change to Bloom’s Taxonomy: the knowledge dimension. Anderson and Krathwohl (2001) have taken “knowledge” out of the cognitive domain and added it as a separate dimension, recognizing four distinct types: factual, conceptual, procedural and metacognitive. See the full taxonomy revision in the figure below. Notice that instead of six ways to think about one type of knowledge, there are now six ways to think about four distinct types of knowledge. This is key! SOURCE: Anderson, L. W., & Krathwohl, D. R. (2001). A Taxonomy for Learning, Teaching, and Assessing: A Revision of Bloom’s Taxonomy of Educational Objectives. New York, N.Y.: Pearson. In fact, both Lemov’s and Berger’s critiques lament the common misconception that knowledge is not adequately emphasized in the revised taxonomy. Anderson and Krathwohl, however, also see knowledge as incredibly important. Knowledge didn’t go away but got its own dimension in the revision. “In the revised taxonomy, we wanted to distinguish knowledge of discrete, isolated content elements (i.e., terms and facts) from knowledge of larger, more organized bodies of knowledge (i.e., concepts, principles, models or theories). What is most important for teachers to take away from this revised taxonomy? Factual knowledge doesn’t transfer. Conceptual knowledge, procedural knowledge and metacognitive knowledge do. This is further, rigorous research that supports the importance of helping students organize information and make connections between abstract concepts in order to gain more insight into the disciplines. Simply trying to match higher-order thinking skills with facts is not going to produce deep learning that transfers. Instructional strategies should match the knowledge type and cognitive process of the learning goal. For instance, if the goal is for students to remember facts, teachers may ask students to use a mnemonic device. But if the goal is to apply concepts, this strategy won’t work. Assessments should align to the knowledge types and cognitive processes taught. Teachers are bound to get poor results when their instruction is mainly at the remember, factual level but their assessments demand that students evaluate conceptual ideas. The new taxonomy is useful in many ways. I love how it reminds teachers to be strategic about both how they want students to think (the cognitive dimension) and what they want students to think about (the knowledge dimension). To be sure, the taxonomy also has its limitations, as all attempts to formalize and categorize the ways in which we learn do. Learning is complex and messy; it doesn’t fit neatly into rows. However, the revised taxonomy and at least the abridged version of the book are essential tools for any curriculum designer. It should be read and consulted, along with other tools, again and again as we develop our expertise in designing learning experiences for students. In the debate between the SOLO (structure of observed learning outcomes) Taxonomy and the revised Bloom’s Taxonomy, both offer useful research and support for students making connections between abstract concepts. Curriculum designers should read and study both. For more practical ways to apply research in the classroom, see Tools for Teaching Conceptual Understanding, Elementary or Tools for Teaching Conceptual Understanding, Secondary. Or join me for a world-changing summer workshop this June in Washington, D.C.
Anderson, L. W., & Krathwohl, D. R. (2001). A Taxonomy for Learning, Teaching, and Assessing: A revision of Bloom’s Taxonomy of Educational Objectives. (Abridged edition, first edition) New York, N.Y.: Pearson. Mehta, Jal & Sarah Fine. (2015). The Why, What, Where, and How of deeper Learning in American Secondary Schools. Students at the Center: Deeper Learning Research Series. Boston: Jobs for the Future.